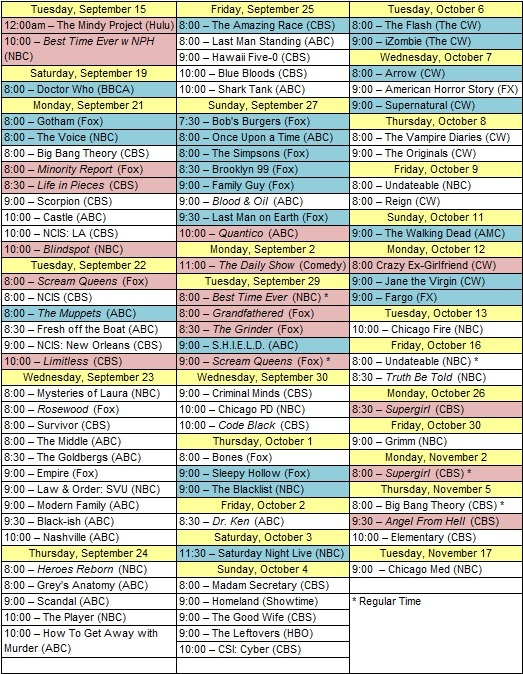 It should be pretty evident that I am a huge TV nerd, so much so that it should not come as a shock that I make an Excel spreadsheet before every Fall TV season. In case you want to know what I am watching or in case you want to know what you should be watching, I am sharing my nerdy spreadsheet. 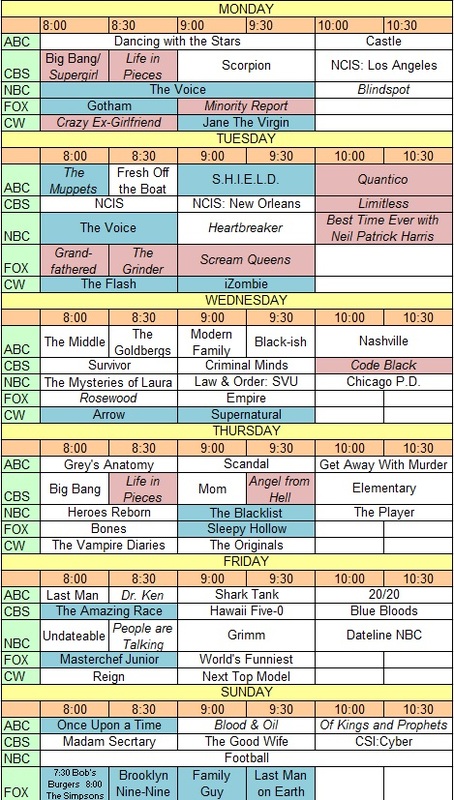 – Blue is for shows that have a guaranteed season pass, red is for either new or older shows that I am going to give a shot, new show in italics. I recently upgraded my DVR to allow for 6 shows to be recording, so I no longer have limitations. – Also, for the first time ever I made a chart of the release dates. – I saw the pilot for Supergirl and I liked them enough to know I want more. – Only new show that is a guaranteed season pass: The Muppets. Duh. – Some shows that are not on the networks that I am jazzed about: Fargo (FX), The Walking Dead (AMC), The League (FXX), You’re the Worst (FXX), Doctor Who (BBC America), The Mindy Project (Hulu). – You may notice that CBS’ schedule looks a little screwy, but that is because of Thursday Night Football. Things will shift around after November, so the Thursday schedule I have listed is what it will be after football. – Just don’t even try to talk to me on Tuesday nights anymore. So go ahead, let me have it. What am I stupid for watching? What are you getting jazzed to watch?